Baptism is an incredible gift from God. In this first sacrament of initiation, we receive the grace of the forgiveness of original sin and all personal sins, and we become the adopted sons and daughters of God and members of his family, the church. 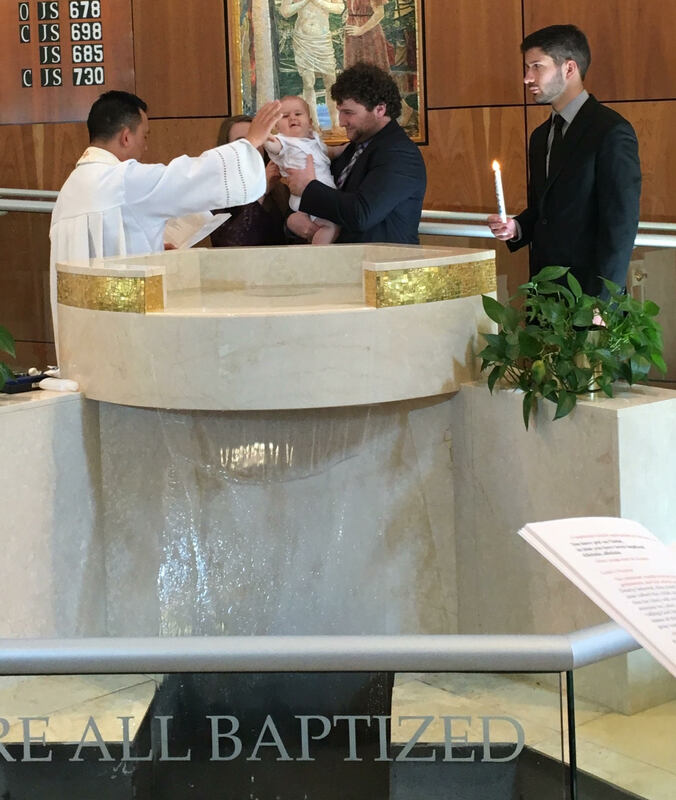 Baptisms are celebrated following the 11:30 Mass on the second Sunday of each month. There are no baptisms during Lent. Attend a Baptism Seminar (parents and Godparents). At Mary, Queen of Peace, this is the last Monday of each month at 6:30 p.m. Call the office at 985-626-6977 to register. You may also attend a seminar at another parish, asking that parish to send us notification of your attendance. After reviewing the packet/documents, our coordinator will contact you to schedule the baptism ceremony date. Family, friends and guests are welcomed and encouraged to attend Baptisms. They are scheduled following the 11:30 a.m. Mass the second Sunday of the month. If your family is interested in a Baptism within a Mass, please contact Charisse Saucier at 985-626-6977 for consideration. The Baptismal Candle, a white baptismal bib garment, and a Certificate of Baptism will be presented to each family at the ceremony. Children going through the program will be baptized at the Easter Vigil. 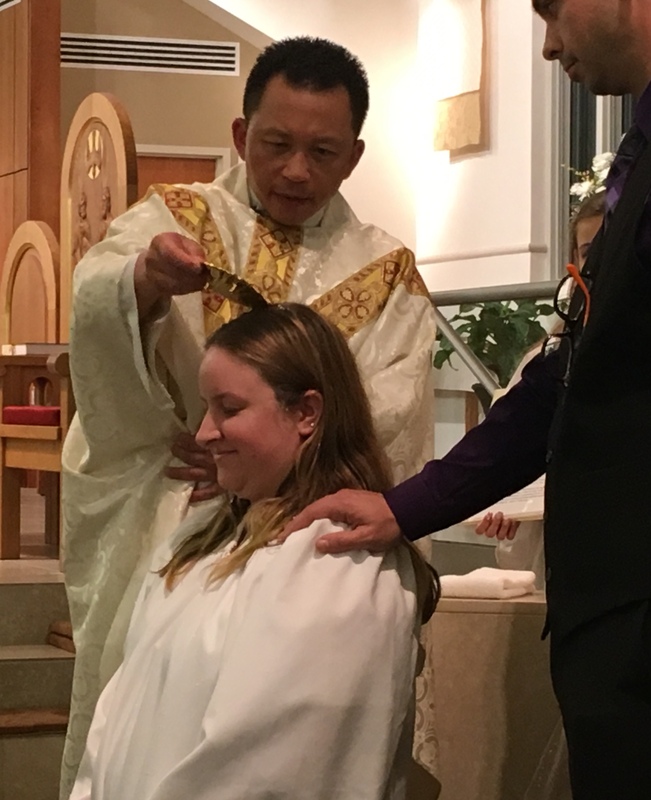 Adults wishing to be baptized will go through the Rite of Christian Initiation of Adults and be baptized at the Easter Vigil. Penance, also known as confession and reconciliation, is one of the sacraments of healing in the Church. The sacrament encompasses four parts: contrition, confession, satisfaction or penance, and absolution. Contrition means that we are sorry for our sins, and we intend to try to do better. Confession is the act of stating our sins to a priest. This is always required with mortal or serious sins, but is also a good and pious practice with venial or less serious sins. Satisfaction or penance consists of prayers or particular actions the priest assigns to us to show our sorrow, and to make some amends for our actions. And finally absolution - the words Jesus Christ speaks to us, through the priest - freeing us from our sins. Jesus set up this sacrament as a way to heal sin and human weakness. He told the apostles: "Whose sins you forgive are forgiven them, and whose sins you retain are retained" (John 20:21-22). Confessions are heard at 4 pm every Saturday in the church and 30 minutes before every Sunday and weekday mass. You may also call one of the priests to schedule a special time for the sacrament. A guide to confession can be found here. Mary, Queen of Peace Catholic Church wants to offer you our love and compassion upon the loss of a loved one. Please contact the parish office at 985-202-0232 to schedule a funeral in our church. Holy Communion is a sacrament of initiation in the Church. In it we are nourished and strengthened for our daily lives. We believe that Jesus Christ is fully present - Body, Blood, Soul, and Divinity. The bread and wine are not symbols, but signs of his Real Presence. Although we normally receive Communion during Mass, if someone is homebound by illness, a Priest, Deacon or Extraoardinary Minister of the Eucharist will bring the Eucharist to that person. If you are homebound or know someone who is, call the office at 626-6977. Preparation for First Communion takes place at Mary, Queen of Peace during the second grade, with reception of the sacrament in May. Your first step: Call the church to make sure it is available. It is important to contact the parish as far ahead of your proposed date as possible since weddings are booked quite far in advance. To begin the process, please contact music minister/wedding coordinator Lindsey Piattoly at 985-202-0241 at least six months before your wedding date. The Sacrament of the Anointing of the Sick is meant to strengthen those who are seriously ill. Many mistakenly think of this Sacrament as "Last Rites." However, the Church's teaching is that the Anointing of the Sick is for everyone who is "in danger of death" from sickness or old age. Most serious illnesses and any surgery that requires general anesthetic put us "in danger of death." For more information contact the church office at 626-6977. The Sacrament of Holy Orders is the continuation of Christ's priesthood, which He bestowed upon His Apostles; thus, the Catechism of the Catholic Church refers to the Sacrament of Holy Orders as "the sacrament of apostolic ministry." "Ordination" comes from the Latin word ordinatio, which means to incorporate someone into an order. In the Sacrament of Holy Orders, a man is incorporated into the priesthood of Christ, at one of three levels: the episcopate, the priesthood, or the diaconate. If you are interested in learning more about the diaconate, priesthood or religious life, contact the pastor at 626-6977. Ill health should never separate a person from the Sacraments or from the Mary, Queen of Peace community. If you, or a member of your family, is homebound, please contact the office at 626-6977. 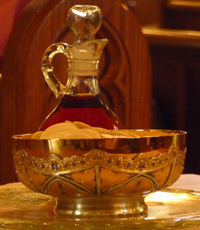 If you would like to receive the Sacraments of the Anointing of the Sick, Penance or Holy Communion while you are hospitalized or ill, call the parish office and it will be arranged.